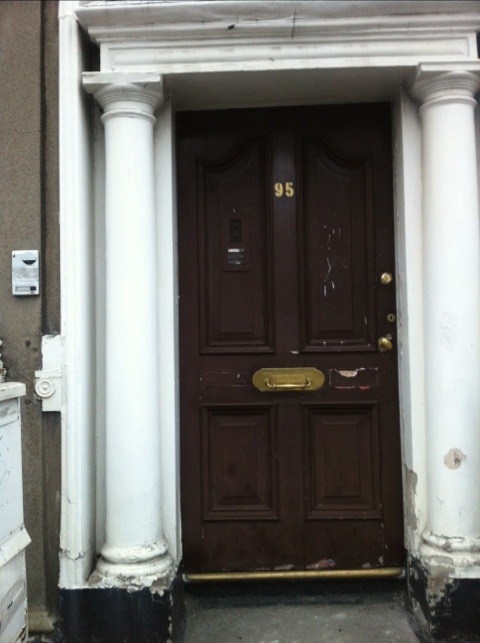 Number 95 Merrion Square- known as Apothocaries’ Hall- is a listed building. It is, depending on which property website you read, sale agreed or was sold to an unknown foreign overseas buyer last November. It stands on the corner of Merrion Square, facing the Oscar Wilde statue, at the end of the Nassau Street/Clare Street tourist trail. It was one of the Square’s first buildings, finished in the 18th Century as part of the square’s transformation into the city’s most desirable address. 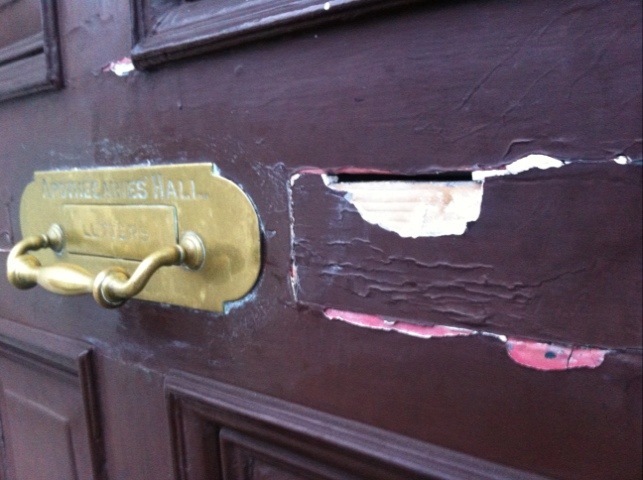 Currently, it has a number of broken window panes, a poorly maintained front portico, a damaged front door and broken guttering. There may be other issues inside the building, but these are the degradations visible from the street. I regularly walk past Apothocaries’ Hall. A few weeks ago, I noticed the broken glass and general air of neglect. I’ve always particularly liked that corner of the Square- it’s near TCD and it used to have Green’s bookshop next door. The Hall has a slightly eccentric first floor greenhouse and some really attractive stained glass windows (now almost hidden under layers of grime). I felt I ought to do something about it. Standing on the side of the road, I took some pictures and then looked up on my phone whatever I could find out about the Building’s history. I also looked the building up on Google Street view. It looked a lot happier then, and was clearly occupied when the Google car passed it by. Because I’m a lawyer, I also looked up if there was any legal protection for the building. It is on the Dublin City Council listed buildings register. 58.—(1) Each owner and each occupier shall, to the extent consistent with the rights and obligations arising out of their respective interests in a protected structure or a proposed protected structure, ensure that the structure, or any element of it which contributes to its special architectural, historical, archaeological, artistic, cultural, scientific, social or technical interest, is not endangered. This fundit proposal is to commission freelance journalist Gerald Cunningham to write a feature article on Apothocaries’ Hall- its history and its current state. I have agreed the rate with him for this article. He will write a feature article on the topic. He will then be free to have that article published -for pay or otherwise, at his own discretion- to the widest audience possible. When we see our built environment being degraded as we walk around our depressed home towns and cities, it is hard to know where to start a fight back. The first thing we need to do is to start a conversation about the value of what we have. Please back this fundit.ie project. 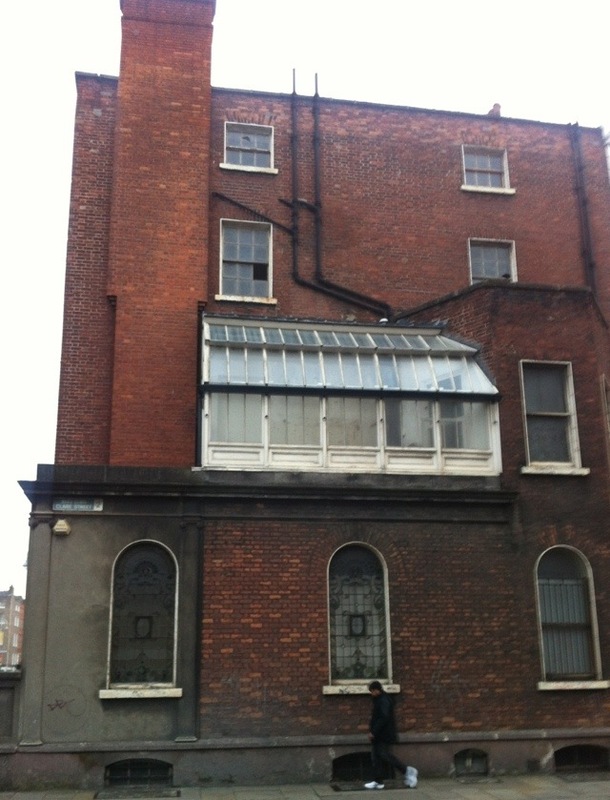 Let owners of listed buildings know that Dubliners don’t stand silent if we see our shared heritage being lost. Let’s shine a light on this one spot. Let’s make a difference. UPDATE: Hello all. Thanks to all the excellent people who chipped in on the Fundit proposal, this article is currently being researched and written. If you have any information about Apothocaries Hall’s past, present or future please do give Gerard Cunningham, who is the journalist writing the piece, a call on 086 6073060. He’d love to hear from you. I’m liking people powered investment more everyday, thanks for this contribution to teaching the values of crowdfunding. I agree one hundred percent, it seems as though you have found a nice niche of approach to the issue. Lots of Dublin is beginning to fall apart, and so much to do with the like of the ‘evil’ that fuels the life of that creeper that comes off Bank of Ireland and streches its tendrils outward along St.Stephens green. Sure whats debt when they say the devil is God inverted. The comments above are inaccurate and do not do justice to current attempts to restore what was once and could again become one of the finest buildings in Dublin. To begin with the buyer is not a “foreigner”, but Irish. The Irish Times reported that the building was sold to “an overseas buyer” and perhaps that is what led the author to make a jump and assume this meant he was a “foreigner”, although why this is relevant is beyond me. He has great plans for the building, which include a sensitive restoration. For understandable commercial reasons he has not yet decided to make those plans public although he is engaging fully with the relevant planners to ensure that existing qualities of the building are protected. Given that, as you note the building was not previously receiving the love it deserved I, as someone who lives and works in the area, welcome the changes. Thanks for the clarification. I’ve amended the question of nationality above. Given that you’re familiar with the current owner of the building, I wonder if you or he would like to call Gerard Cunningham, who’s writing the feature piece, on 086 6073060 for an interview. And, my apologies if not, but would you like me to amend the spelling of your surname on your comment to McEnaney? I’ve just read your post on this. There is also protection under the Derelict Sites Act. This is actually quite a draconian piece of legislation in some ways. It is only sporadically invoked, which is probably why it has not been properlt scrutinised – other than in the relatively recent Egan case.